People of "normal" weight who sport a wide waist are more at risk of heart problems than obese people, said researchers Friday, urging a rethink of healthy weight guidelines. How fat is distributed on a person's frame determined disease risk as much as how much fat they had overall, according to an investigation of nearly 1,700 people aged 45 and over. Even people who are not classified overweight on the Body Mass Index (BMI) scale, should be concerned if they had an "apple" shape with a waist wider than their hips, said research leader Jose Medina-Inojosa of the Mayo Clinic in Minnesota. Such excess fat around the middle is called "central obesity". 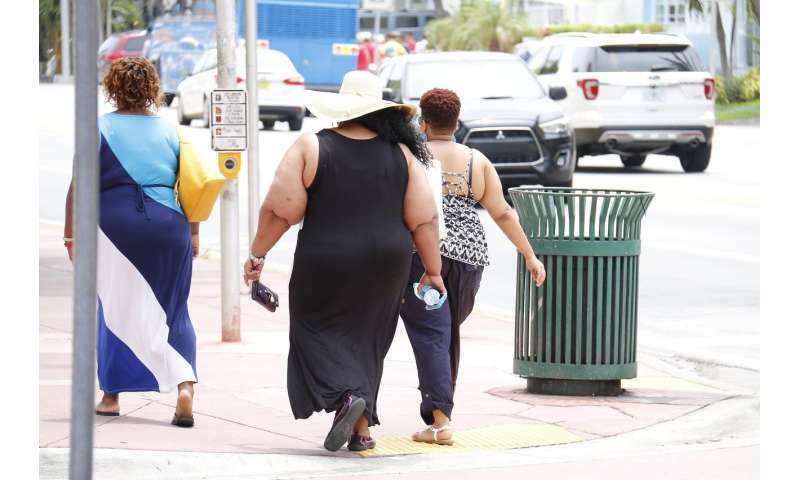 "Current guidelines do not recommend measuring central obesity in those with normal weight as they claim their is no risk exposure," Medina-Inojosa told AFP. "We found greater risk... for those with normal weight and central obesity, on the contrary. This has the potential to change guidelines." Study participants, 1,692 residents of Olmsted County, Minnesota, had their weight, height, and waist and hip circumference measured between 1997 and 2000. They were monitored until 2016 for cardiovascular diseases such as heart attacks and stroke. Participants with a normal BMI but central obesity had a two-fold higher long-term risk of disease than pear-shaped participants—even technically obese ones, the research found. BMI is a ratio of height to weight used to divide people into low- or high-risk categories for developing heart disease, high blood pressure, type 2 diabetes, or certain cancers. The World Health Organization has defined "abdominal obesity" as a ratio of waist circumference divided by hip circumference of 0.9 or higher for men, and 0.85 or higher for women, or a BMI of 30 or more. The new data showed that people with a "normal" BMI of 18.5 to 24.9 must not automatically be considered at low risk of heart disease, said Medina-Inojosa. "If you have fat around your belly and it's greater than the size of your hips, visit your doctor to assess your cardiovascular health and fat distribution," he said. "If you have central obesity the target will be waist loss rather than weight loss." The data is the latest to question the current reliance on BMI in healthy weight guidelines. The results were presented at a congress of the European Society of Cardiology in Ljubljana, Slovenia. They have yet to be published in a peer-reviewed journal.